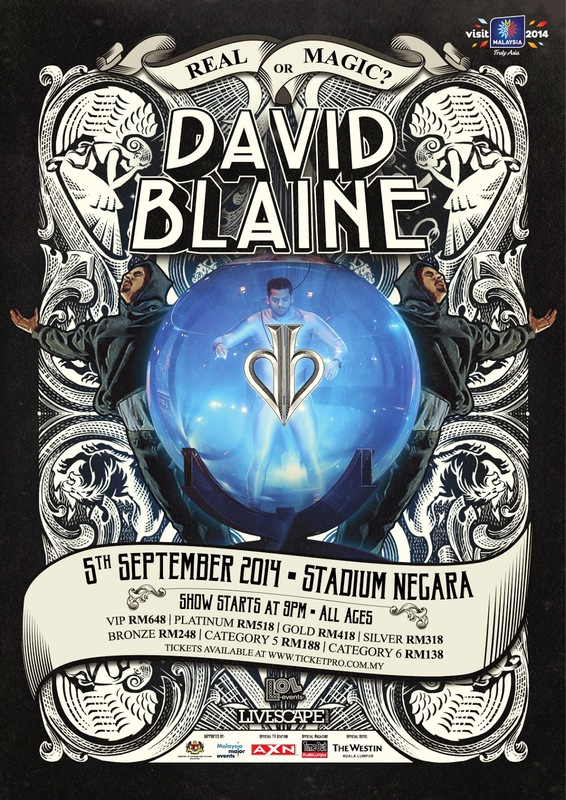 [Upcoming Event] WORLDWIDE MAGIC SENSATION LIVE IN MALAYSIA David Blaine in His First Asia Tour! Proudly presented by LOL Events & Livescape Asia, the world’s most enigmatic magician, David Blaine, will be having his Asia Tour live in Malaysia on 5th Sept 2014 in Stadium Negara, Kuala Lumpur. blowing endurance stunts such as “Frozen in Time” in which he was frozen into a block of ice for 72 hours. Other stunts include “Above the Below”, in which he went without food for 44 days and “Vertigo”, where he stood for 44 hours on a 22 inch platform. “Human Aquarium” involved submersion in a water-filled sphere for seven days, receiving air and food through tubes. In a dramatic finale, he failed in his attempt to break the world record for holding breath under water, while simultaneously escaping heavy chains. His television specials, his first David Blaine:Street Magic and David Blaine: Magic Man, have received huge ratings worldwide. His recent celebrity packed special David Blaine: Real or Magic had Katy Perry, Will Smith & family, Harrison Ford, Breaking Bad duo Aaron Paul & Bryan Cranston, Ricky Gervais and many more marvel at his tricks. David will now embark on his first Asia tour and will stage illusions and endurance stunts. He will take the audience on a journey in the 90 minutes performance where the audience will be left guessing if his act is REAL or MAGIC. “Most believe that the greatest trick that a magician can do, is to convince the world that the impossible is real. But when the magic is real, yet seems impossible, that, is the greatest trick of all.” Tense. Mysterious. Inquisitive. Even more tense. In every video you watch involving this one man, these are the raw elements you’re guaranteed to experience. He speaks with an impeccable characteristic air as he approaches any group of unsuspecting people. He is one that keeps a steady and undisturbed aura when astonished and amazed chaos dances around him as he blows minds one by one as if he thrives on it secretly. This mystifying man has successfully grasped the world’s attention by the very core in a matter of seconds. 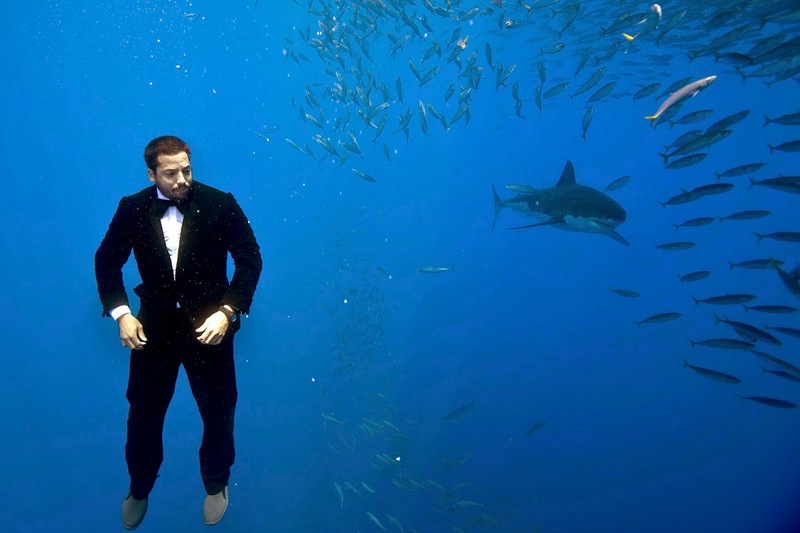 This inscrutable gent that we speak of, is none other than celebrated American illusionist David Blaine. With a slew of monikers and recognitions under his name, David Blaine blurs the lines between reality and illusion, with the ability to defy the laws of gravity and human logic and levitate himself before baffled onlookers. David is also an endurance artist, and is best known for his high-profile feats of endurance, which have broken several world records. One of them including a Guinness World Record for “Longest Breath Holding”, by holding his breath underwater for a staggering 17 minutes and 4 seconds feat. Other incredible achievements that challenge the impossible and the human brain includes being buried alive for a week in a see-through coffin, spending more than a month suspended in a box by the River Thames in London and being encased in a block of ice for 63 hours. 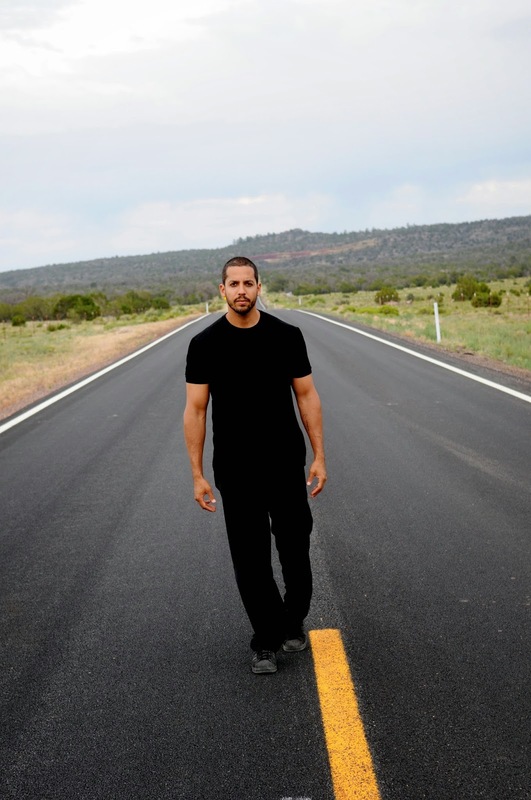 Blaine’s thirst for betting against all odds to go to the extreme and his unrivaled skills to trick the mind has become his primary tools of the trade, and come this 5th September 2014, David Blaine will employ both with spellbinding flair. Producing scorching fire from within his physical body, confounding the minds of the audience encased in a world without the simple need to breathe without oxygen underwater, Real Or Magic will leave you perplexed and stunned as Blaine transforms society’s views on magic and illusion in the show. There was only one man in history who was able to perform this act, and he, however, died doing it. That man was Hungarian-American illusionist and household name within the magician community, Harry Houdini. In a show about illusion and misdirection, who can believe anything? Stabbed, starved, pierced, burned, electrocuted, nearly drowned, levitated, and fallen from great heights, watching David Blaine perform magic up close and personal will leave you questioning what’s real, and what’s magic. 5th September 2014 will surely make for an intriguing and fascinating night, inspiring people to understand the impossible, and the magic from within.